I love my time spent teaching a class of 16 in Davidson yesterday. We all had so much fun! There was so much laughter and 'wow' moments. I did a Beginner Hand Embroidery class for the quilt guild there. They were a wonderful bunch. The drive there was rather miserable - it was a total white-out with the blowing snow. Still, I do love highway driving. It's like watching a landscape movie. : ) I love teaching in all these prairie cities. The drive back was clear, sunny, and colder than minus 30C with the windchill. It was BEAUTIFUL out. I just adore winter. I parked off a grid road with boots up to my knees and took some photos. SO BEAUTIFUL! I love, love, love the yellows and the blues. I love the variety of blue in the sky. Aren't the blue shadows on the snow gorgeous!? For those of you who live where there isn't winter... did you know shadows are blue here? I love the way the low winter sun makes the longest of shadows. 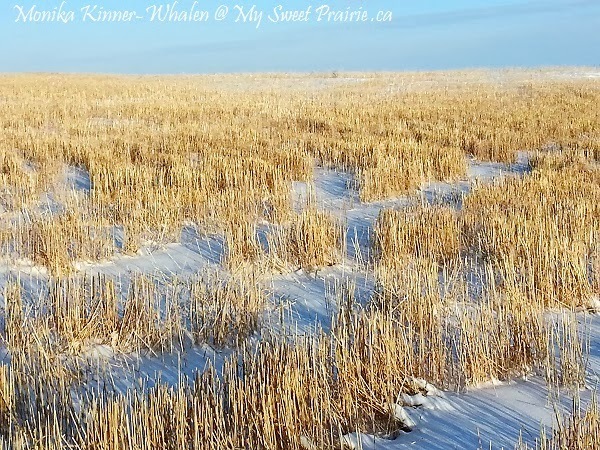 All the stubble on the fields are the sweetest of yellow this year. 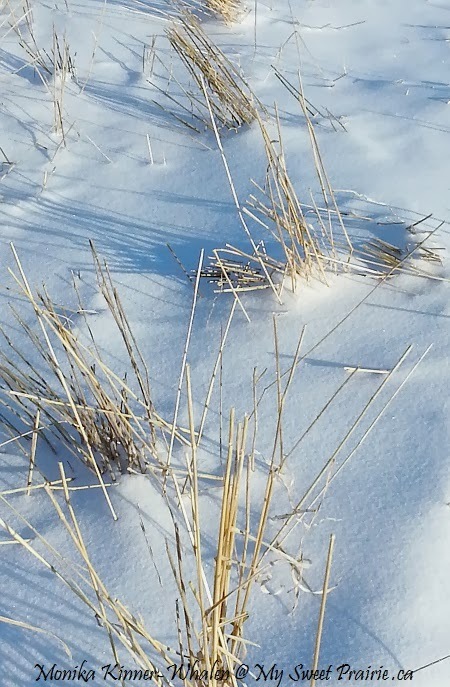 I love how every single plant casts a perfect crisp, clear shadow on the snow - every single one! 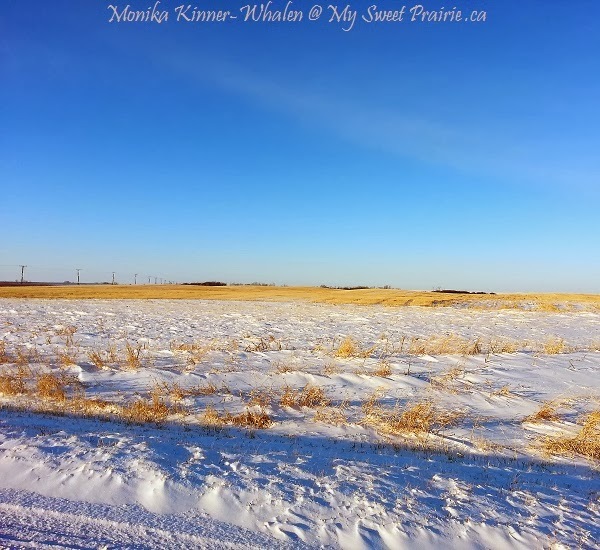 I love how you capture the beauty of the prairies, Monika. Wonder what creation these photos will inspire? Just stopped by during Blogathon Canada. I am glad I discovered your blog. Beautiful photography; awesome work. 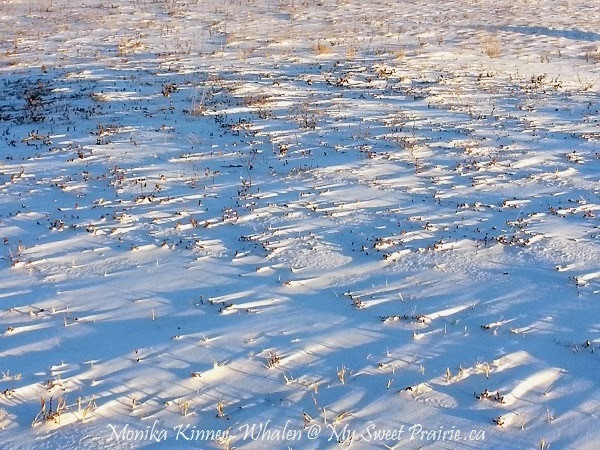 I now live in northern Manitoba but was raised on the prairies and love the snow on the stubble with all its shadows. Your photos bring back fond memories. Always a pleasure to visit here. I'm not a beginner when it comes to embroidery, but it would be fun to take class here and there. Have signed up for an online crazy quilt class, I do hope it covers some embroidery. Como a neve é linda! Eu nunca vi ou toquei neve de verdade. Não conhecer faz ser mais fascinante. Lindas sombras azuis. As snow is beautiful! I have never seen or touched real snow. Not knowing makes it more fascinating. Beautiful blue shadows.